Commenting on this launch, Mr. Partha Ghosh, Senior Director (Global Established Products) said, “Acidity can be a recurring condition which can strike anyone, anytime, anywhere. It can cause heartburn and serious discomfort which can impact normal work. Research reveals that many who suffer from acidity do not take it seriously and either ignore it or resort to traditional methods to deal with acidity attacks. While traditional methods may provide symptomatic relief, it does not address the real issue. Gelusil’s balanced formula not only provides instant relief by neutralising the acid secreted but also provides long lasting relief by protecting the stomach lining from damage due to excessive acid”. This newly launched easy-to-carry sachet has a unique proposition of a ready-to-consume solution for acidity that does not require water or a glass. It’s tamperproof packaging makes it convenient to carry and consume it just anytime / anywhere. “We noticed that today’s on-the-go generation needs something that is easily accessible and portable. As a leading brand in the category it is important that we continuously look for newer and better ways of meeting the ever changing needs of the consumer. That’s how the idea of a sachet was born” added Mr Ghosh. Hurry, worry or curry can lead to acidity attacks. 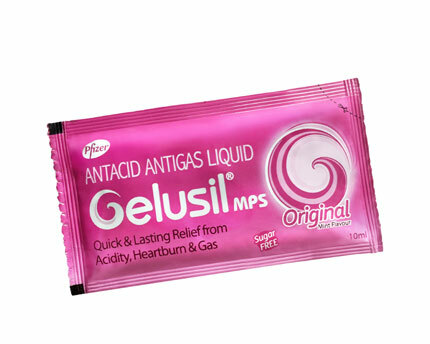 If you cannot avoid them, make Gelusil sachet your ally and be ready for the next party.